We had a rare event here today at Dufresne’s Sugar House. We boiled sap in the morning. We had had a power outage after our last boil and had not realized that it upset our equipment. 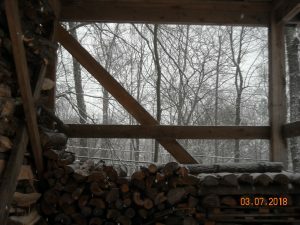 When we tried to get ready to boil last night, after we finished gathering the sap, as we usually boil at night, we had some difficulties processing it for boiling. When 1:00 am came around and we had not yet begun boiling, we decided to get a couple of hours sleep before starting. We got up again at 5:00 am to start. We were finished by noon. 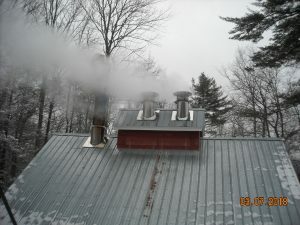 We always try to boil the sap as soon after gathering as possible. 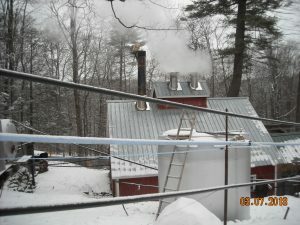 The faster you process the sap the better the end quality of the syrup. 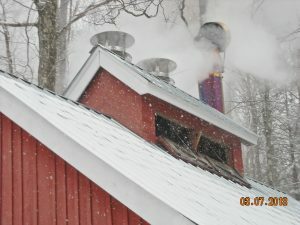 Most other sugar houses wait and boil the next day after every run. We will give up sleep to maintain the high quality of our product.